August is the last month of Winter month and by the end of the month it is usually warming up nicely ready for Spring. Whale watching is very popular this month, with some lucky whale watchers spotting the newly born baby calves on their first trip south. It can be cold, but it can also be beach weather. Just love our winters! On this page and through the links you will find everything you need to know about visiting the Gold Coast at this time of the year. If you are ready to start planning your holiday to the Gold Coast Click Here to find out about my planning cheat sheets, tips & tools to step you through! 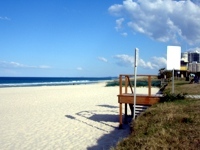 August is the last month of Winter on the Gold Coast! It's Showtime! In August, both Gold Coast and neighbouring Brisbane hold shows. The first one is the EKKA, which is the Brisbane Agricultural Show. It runs for 10 days around the middle of the month. It's a fun show where country life meets the Big Smoke! A mix of animal exhibitions, food, produce, cake competitions, show bags and rides. Very commercial but lots of FUN! The Gold Coast show, is similar but on a smaller scale and only runs for 3 days at the end of the month. There aren't any school holidays during August but there is usually a Gold Coast only holiday at the end of the month for the Gold Coast Show. For Brisbane and surrounding shires, there are Show Days during the EKKA, and these days affect the crowds at the theme parks and attractions on the Gold Coast. August is the middle of the whale watching season on the Gold Coast and you can sometimes still see whales going north and those coming back and heading back down to Antarctica. Apart from the incredible beaches (check out the water temperature to see if you would swim here in August!) and awesome winter weather, August is great for windsurfing and kitesurfing. 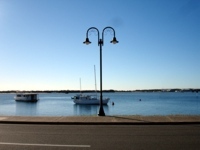 Choose between the calmer Broadwater or go wavejumping on the ocean beaches. There are options to day trip to Tangalooma from the Gold Coast and even stay late to be part of the wild dolphin feeding. During the day, you try sand tobogganing, snorkelling around the Tangalooma wrecks or a whale watch cruise. Just about everyone wants to know if you can still go to the beach in August or the Gold Coast's water theme parks - Wet n Wild and WhiteWater World. And you can, but you probably need to pick your days! August is a great time to visit the Gold Coast and you can enjoy almost all there is to see and do, including seeing the whales! All the information below is updated each year to keep it current. I recommend, if you haven't already, that you get a copy of my planning cheat sheets. Use the information on this page to fill them in, to help plan your holiday. In the table below are averages for various weather indicators for Gold Coast in August. Click here for current weather information in Gold Coast. Clear blue skies and warm during the day with cooler nights. Cooler in the hinterland as the sun starts to go down – but definitely coming out of winter towards the end of the month. Relative to other times of the year humidity is low for the area. Very little rain. August can be a windy month. Bring layers and a jacket for the evenings. If you are going out on the water bring something waterproof and warm it can get cold watching whales! Having said that, there are still days during August that even us Queenslanders get out on the beach - so pack your beach gear too! These dates are a rough guide to holidays in both NSW and Qld which have most influence on holidaying in the Gold Coast. * - Gold Coast Show is usually at the end of August, but can fall in September. This date is provisional. What's On In The Gold Coast In August? More events and dates for August events on Gold Coast. Yet another stunning month on the Gold Coast! The weather is warm enough to enjoy everything but not so hot that you get tired with the heat. It can be windy in August so great for sports such as wind and kite surfing and sailing! Accommodation with a heated swimming pool is highly recommended. Along with July, August can be one of our coldest months in the Gold Coast, especially the early part. Pack a mix of clothing for warm weather during the days and cooler weather in the late afternoons and evenings. You will need some warmer clothes for days when it isn't sunny. The wind, especially when it comes from the south or west can be VERY cold! I pack layers which are easy to carry and can be put on when it turns a bit cooler. For me being cold is horrible, but so is sweltering in heavy clothes on a sunny winters day! Don't get me wrong, there are days in August when I will be on the beach and occassionally, I might even dip my toes in the water! If you are inland or up in the hills it can get cold very quickly when the sun drops behind the mountain ranges. A rain mac can be used as an extra layer of warmth and wind protection and is very useful if you plan to go whale watching for protection against the wind over the ocean or some stray whale spray! Winter in the Gold Coast is simply unbeatable! August is no exception. Days are warm with clear blue skies and nights can be quite crisp - though definitely by the end of the month temperatures tend to be rising. August can be windy which is great for sports such as sailing, surfing, windsurfing and kite surfing. Highly recommend accommodation with a heated pool if you like to swim after a day's sightseeing - this will definitely make it more enjoyable. Most of our northern hemisphere visitors are coming from Summer weather to our Winter weather. Gold Coast is a popular destination for those from the middle east escaping the incredible heat of summer. Gold Coast Winters are mild, but you will need to make sure you take time to get used to our different temperature. Young children may feel the cold a little more than adults. August, along with July is one of our coldest times and I recommend packing a mixture of clothes for both warm and cold weather. During the day if it is sunny the temperatures can get up to the low 20s. Inland rainforest areas such as Mt Tamborine, O'Reillys, Lamington Plateau or Springbrook National Park are significantly colder at this time of year than our coastal ares. Make sure you have plenty of warm clothes if you visit these places, especially on windy, cloudy days or later in the afternoon. Layers, light jumper or fleece for cooler times and a light jacket for evening. You will want something to stop the wind if heading out on the water in case it is windy. Take a tour to Byron Bay. This month at Tropical Fruit World you might even get to try Caramel Fruit and other tropical fruit delicacies. Rainforest walks in Lamington National Park. Full or half day offshore game fishing trip - wonder if you might catch a Cobia? NEW SHOW *** HEARTLAND *** - MUST SEE SHOW Book Now - Australian Outback Spectacular Dinner & Show. Book Tuesday to Friday Nights & Sunday Matinees, or Saturday Nights for $10 more per person. Jupiters Casino (now known as The Star Gold Coast) - Check out all the live entertainment for Gold Coast. Draculas Dinner & Show fabulous night if you enjoy some humour, B grade horror movies and scary stuff with dinner! Current Show: Dracula’s Cabaret on the Gold Coast latest show is Retro Vampt from July 2016. Your Questions About Gold Coast in August? Do You Have A Question About August In The Gold Coast.? Ask a specific question about August in the Gold Coast, Queensland or Australia is and I will try my best to point you in the right direction. Unlimited Entry to Dreamworld WhiteWater World and SkyPoint over 3 consecutive days. Plenty of time to visit for a full day each at Dreamworld and WhiteWater World and visit SkyPoint by day, night or both at your leisure over the 3 days. Use within 12 months of purchase date. Unlimited entry to Dreamworld, WhiteWater World and SkyPoint over 3 consecutive days from first gate entry. Discount Coupons to use in park. Unlimited entry to Dreamworld, WhiteWater World and SkyPoint For 12 Months - Plus Bonus 12 Month Unlimited DreamPix PhotoPass valued at $99. This pass is excellent value for locals or visitors who plan to enjoy access to these theme parks for multiple visits. Annual Pass with 12 months Unlimited entry to Dreamworld, WhiteWater World & SkyPoint and replaces the dated Season Passes. 12 months starts from date of first entry and tickets must be redeemed within 12 months of purchase. BONUS - Unlimited DreamPix PhotoPass valued at $99. BONUS - Discount Coupons to use in park. Visit Sea World, Movie World and Wet n Wild once each over 3 consecutive days. Adults save nearly 50% over single entry tickets and these online prices are cheaper than at the gate. Cheapest option for Village Theme Park Passes. Pass valid for single entry to each of the theme parks Sea World, Movie World & Wet n Wild over 3 consecutive days. Cheapest way for entry to 2 or more theme parks. Pass is valid for 12 months from purchase. Spend a few hours or a whole day at Currumbin Wildlife Sanctuary. Watch the shows. Hand feed the kangaroos. Get your photo taken with a koala. There's so much to see and do. Check out all the information about Currumbin and other activities. TOP PICK for visitors who want to see, touch and get photos with some iconic Aussie animals. Single Day Entry Ticket To Currumbin Wildlife Sanctuary. Includes shows, excludes food for animals, photos with animals and other extra activities such as Segway Safari, Ropes Course etc. Follow links for all pricing including special limited time deals and family options. Great evening of entertainment. Enjoy a story of Australian outback life showcasing horsemanship & Aussie mateship. Watch the show whilst enjoying your 3 course dinner. Fun night with lots of great memories and a souvenir bushman's hat. *Prices shown for Tuesday, Wednesday, Friday Night & Sunday Performances only. Add $10 per person for Saturday Nights. Book now for all shows. Child, Vegetarian & Halal meal options available. MUST SEE Dinner & Show. SAVE on Tuesday to Friday Night & Sunday Matinee Shows.